A bit off topic of computers, but I figure you guys here have the knowledge & skills for what I'm trying to do anyways. So I have an LED strip that is currently powered by a battery pack & I would like to convert it so that it has a cord & I can plug it in 24/7. So what type of inverter would I want/need to add a wire & plug to these type of LEDs? Also, can anyone tell me why the end piece is discoloring like it is and if it's safe? The reason only the end piece itself is affected is because I am only using that section of the LED strip in a glass art display. You will have to find out the exact specifications of the voltage and amperage provided by the 3 batteries and converted by the electronics in the circuit board. Then you will have to find out if there exists any converter box to run off of the PSU. I would just buy an LED strip to replace it that will run off of your PC's power. Hmm I should just be able to use a voltage meter on the battery box with new batteries to see what the output is? This isn't on my computer, it's a separate non-computer light, but I figured the community here has the knowledge to help me out. The key to this piece of dichroic art piece is the LED strip is basically invisible because it's just a thin wire with some drops of LED goo every few inches, so it works perfect for this application. Any idea what these kind of LEDs are called so I can try to find a set with a converter box & plug? 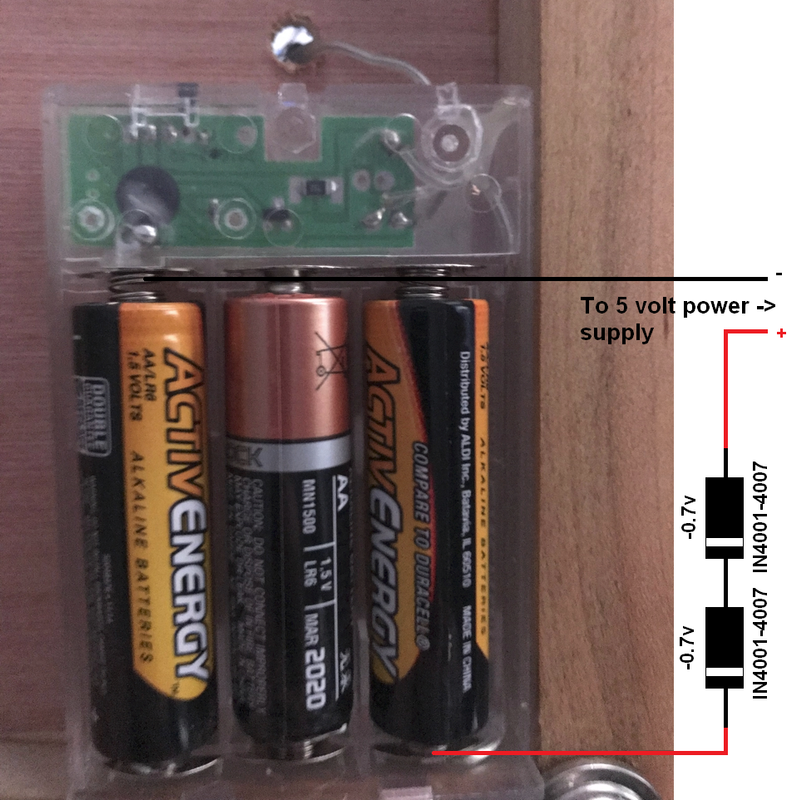 3X AA batery is going to be 4.5V when fully charged and drop down to 3.6V when getting low. Then the circuit is just going to be a current limiting resistor and switch most likely. Most simple way would be keep the circuit there and wire it to some old wall adapter you have from like a old router. Check the sticker on the wall adapter to make sure its some where between 3.6 and 4.5v other wise youll need to use something like a zenner dieode in line to drop voltage from a 5V one which would drop it to about 4.3v. Ok great I'll try out the router plug and report on how it works. Well I found 2 small wall plugs with USBs on them, I think they were from bluetooths. These are both pretty small power plugs and the only 2 I had in general. Last edited by TheGreyWizard; 12-05-2018 at 03:37 PM. Fully changed AA batteries can be about 1.6 volts. chances are 5v would not harm the leds(unless they are running the leds to the max). I recommend a USB power supply with as many 4001-4007 diodes(normal cheap rectifiers) in series as required to drop to a voltage your are comfortable with. A 4001 diode will generally drop 0.7 volts. so a single diode should bring a 5v supply down under 4.5. The voltage drop will depend on the current being drawn as well. 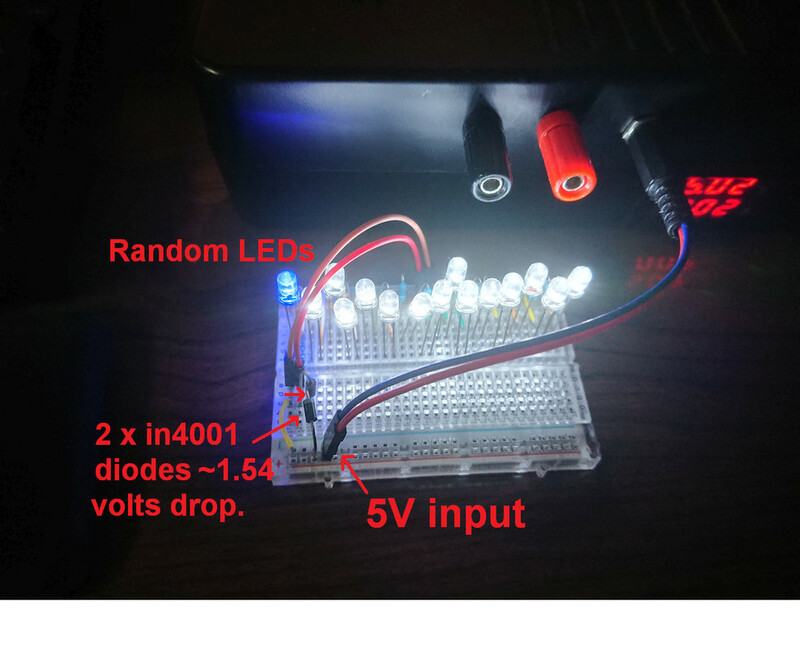 I used a single diode to drop 5 volts for a flashlight that had a "4.1" volt lead acid(it was over 4.5 at full charge). I can draw what you need to do if you wish. I made a quick paint drawing of how it would be connected. The IN4001 diodes drop about 0.7, but it will drop more as the power draw increases(and a bit less if the load is very low). I would guess only 1 diode would be required for this application, but if you start with 2, you can test the voltage and see what you get. This is only 1 of many ways you can do this. As mentioned above you could use a zener diode regulator(2 components) or even a linear or switching regulator(regulators have the advantage of allowing a wide range of input voltages. ), but for this project, I do not think it is required. If you knew the power consumption of your lights, you could have used a single resistor to "eat" the extra voltage. You have 2 power supplies. 1 that is 5-6 volts @ 500ma. This power supply does not appear regulated and will most likely deliver closer to 6 volts under the light load of your leds. The LG power supply lists 5.1 and seems to be regulated. I think I would use the LG power supply. To get power out of these units you will either have to cut the plug off or get a matching plug. Do not cut the plug off if you still need to use those power supplies. In my illustration, you would connect to the existing battery compartment. This leaves the strobe mode and on and off switch functional. Connect negative to the far left top battery connector and positive to the lower right connector. Once connected, before powering up(power supply plugged in and led's turned off), check the voltage with a meter set to DC(check at the newly connected battery terminals). Turn it on and check again. A small drop is to be expected as the leds will draw power once switched on. As long as you are under 4.5 volts, you are good to go. If the voltage is lower, you may notice dimmer light from the leds. This should not hurt the device or else dead batteries would hurt it. If you have questions. just ask. I will try to make a demonstration picture a bit later today. Here is a practical setup for testing. I have about 200ma of leds when run from 4.5 volts. The blue one is because I had no white with long leads left. I placed the 2 IN4001 diodes in series with the + side. This causes about 1.54 volts to be dropped leaving about 3.46 volts. LEDS are dimmer, but light and will last forever. With a single diode the voltage drop was about 0.8v leaving about 4.2 volts. leds are slightly dimmer, but with batteries the voltage had to drop overtime anyway. I hope this gives you an idea of what I was talking about. You can also get USB or other plugs that can be mounted on the light. This would give a clean finished look to the project. I also would not use diodes to drop lots of voltage. if you had 12 volts, a switching regulator would be best(much less heat than a linear regulator). EDIT first image has been re-added. I just fluke noticed it does not work on some mobile devices. Last edited by Nukemaster; 12-07-2018 at 10:35 AM. Reason: Added information and fixed spelling errors.